Okay, I think I am emotionally settled down enough to write this review. I have cried in many movies over the years, but I have never cried in the car on the way home before as I did for this documentary. And the thing is… there is no major reason for tears. It’s not like there was anything tragic presented or any unknown surprise that tainted Mr. Rogers’ character for ever and ever. It is inspirational and loving and shows you how wonderful this man was. So why was I so emotional over it? I was not alone as my entire theater was wrecked at the end. One lady sitting down the aisle from me had to sit there for awhile before she got up. You could hear the sniffling and the blowing of the nose in my theater. It was not as if I had been a huge viewer of Mister Rogers’ Neighborhood as a child. I mean, I watched it, but I was always more of an Electric Company/Sesame Street type of kid so it was not the nostalgic feel of the doc that got to me. The documentary covered Fred Rogers’ life from a child (although they do not dive too much into childhood years, they do cover some) to his becoming a host of an educational program for children, right up to his death in 2003. We heard how Fred Rogers had initially intended to become a minister and eventually became an ordained minister, but he changed his path with the expansion of television. He come up with an idea for a children’s program that spent time education children and showing them that they mattered instead of wasting time hitting people in the face with pies. Despite being a minister, Fred Rogers never preached to the audience that he had. It was more than he showed that an adult can provide love and support for a child and they can do the right thing. Mister Rogers’ Neighborhood was way ahead of its time. The show spoke to children with intelligence and honesty and did not speak down to them. Fred Rogers dealt with many topics that nobody was covering on a children’s program before including the assassination of Bobby Kennedy, divorce, death, racial issues, the Challenger explosion. He was doing topics right up to September 11th. The documentary showed footage of Fred Rogers speaking in front of U.S. Senate in 1969, who, led by subcommittee chairman John Pastore, was looking to cut the money (20 million) given to PBS by the government. The hearings seemed to be a done deal as Pastore was dismissive of all the speakers who would come before him. Then, there was Fred Rogers. Fred spoke to Pastore and talked about how important it was to provide intelligent education for children and then he recited lyrics from one of his songs that he would sing on the episodes dealing with releasing anger. When he was done, Pastore said that it was amazing and that he just earned $20 million dollars. Can you even imagine such an event happening in the Senate in today’s toxic society? The film did not shy away from issues either. It addressed the rumor about Fred Rogers secretly being a sniper in the Vietnam War. It addressed the issue of FOX News when it blamed Mr. Rogers’ Neighborhood for raising a generation of people who think they deserve handouts because they were told they were special. It addressed, in Mr. Rogers’ own words, how much doubt he had at times in doing what he was doing, and the feelings that were hard to express in his own words finding it easier using his puppets instead to get the words out. Above all else, the genuine relationships built by Fed Rogers with children over the years shone through the screen and showed just what a remarkable man he was. You knew he cared about these children because you could see it. I can’t even fathom how many children’s lives had been made better by a song or a puppet or a kind word. Maybe that is what caused such a release of emotion from me. Or maybe it was the fact that we are currently in such a horrible environment of toxicity in the world around us and that we do not have a Mister Rogers to lead us out of it. Or maybe it feels as if we have taken so many steps back over the last few years to a time before any of these moments were done. Maybe it is because I am a teacher and I see how flawed I am by comparison. 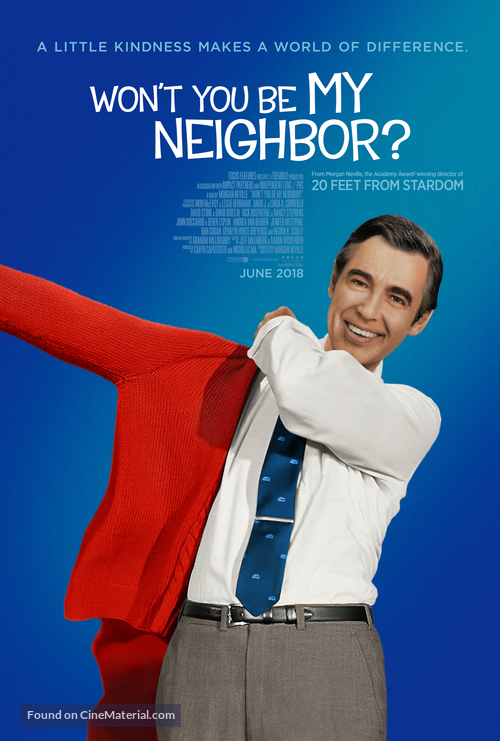 No matter what the reason, there are plenty of lessons we can learn from Won’t You Be My Neighbor?, and these lessons are desperately important for the world we live in today. The movie’s tag line is “A Little Kindness Makes a World of Difference.” Truer words have never been spoken.